Printronix L5520 Continuous Form Printer continuous form laser printers have the capability of printing high-resolution forms as well as printing on other media, such as plastic cards, pressure sensitive labels and synthetics. Flat paper path ideal for special media. PrintNet Enterprise allows remote management and control of printers quickly and easily. By installing the PrintNet Network Interface Card (NIC) into your laser printer and adding the Java-based Printronix Printer Management Software to your network, you can completely monitor the vital status information (fault status, configuration) of a single printer or a whole network of printers worldwide from any PC desktop. 20-ppm continuous form (fanfold) output. Power of Java to work on any platform – Windows, Unix, Linux. Familiar Windows tools such as drop-down menus, custom toolbar and virtual control panel to manage printers with point-and-click ease. 200,000 page per month duty cycle. Standard 300 dpi resolution, optional 400 dpi, 240 dpi. 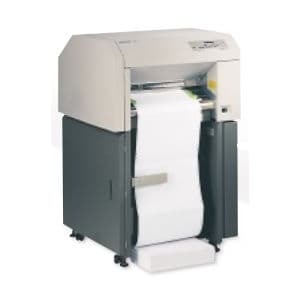 Wide print web solution-14.6″/370.84 mm printable area, handles up to 17.5″/444.5 mm forms. All industry-standard bar codes resident – including Maxicode, PDF 417, Code 39, UPC, EAN, Postnet, Code 128, Interleaved 2 of 5. Cut sheet option for Printronix L5520 Continuous Form Printer. The ENERGY STAR® qualified Printronix L5520 Continuous Form Printer power conservation system provides savings on energy cost, reduces wear and tear on the printer and uses 40% less power than laser printers. These printers are built to last for years and years, a key ecological benefit over shorter life cycle products such as laser and serial printers. Accommodates paper with high recycled content, easier recycling of completed print jobs, ozone reduction and none of the fine particulate emissions found in laser toner cartridges. Engineered with features that promote less energy consumption and generate less waste the Printronix L5520 Continuous Form Printer provides the right printing solution for a greener world.